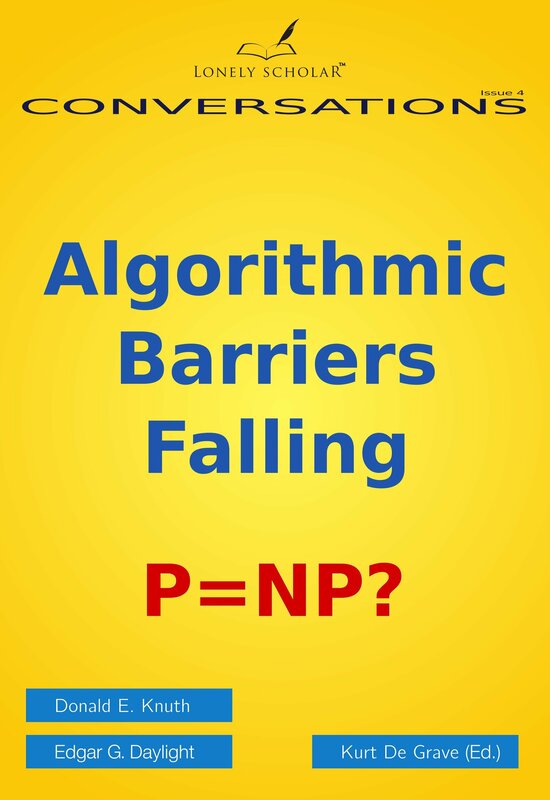 Book review: Algorithmic Barriers Falling: P=NP? TUGboat, Volume 36 (2015), No. 1. Donald E. Knuth and Edgar G. Daylight, Algorithmic Barriers Falling: P=NP? Lonely Scholar, 2014, 116 pp. Paperback, US$20.00. ISBN 978-94-9138-604-6. Daylight is on a mission to further his “understanding of computer science by analyzing and documenting its past” (http://tug.org/interviews/daylight.html). To this end he has interviewed several pioneers of computer science and published the interviews (http://www.walden-family.com/ieee/daylight-knuth.pdf). Also to this end, Daylight and his editor Kurt De Grave have established a small publishing company for Daylight’s work. This second interview of Knuth moves back and forth between discussion of the early days of computer science and Knuth’s current feelings about topics such as the writing of computing history and whether P=NP. As with the first Knuth–Daylight interview booklet, this interview is interesting, easy to read, and relevant to the world of TeX. In chapter 1, Knuth mentions how in the 1960s he decided to call the work he liked to do “analysis of algorithms” and hints that Analysis of Algorithms would have been a more appropriate name for his series of books titled The Art of Computer Programming. Chapter 3, 4, 5, and 7 discuss various topics in the early history of computer science. Chapter 8 is about the development of TeX and literate programming. Some parts of this are already familiar to those of us who have read about Knuth’s creation of TeX, but it also emphasizes how he moved from his original idea of trying “to express letters mathematically by measuring photographic images” (that didn’t work out well) to the idea of “capturing the intelligence of design instead of the outcome of the design.” He also explains the double meaning of the word “strokes” in the dedication of The METAFONTbook: “to Herman Zapf, whose strokes are the best”; Zapf not only draws beautiful strokes—he also stroked Knuth in the form of positive and negative critique. With regard to literate programming, I didn’t previously know that Knuth was partially influenced in the METAFONT creative effort by a report by P.-A. de Marneffe titled Holon programming: A survey. Chapter 9 discusses the problem of whether or not P=NP and Knuth’s current opinion that P does equal NP. This chapter finishes with Knuth noting that he will write no more published papers (only books). He says his last paper was the one published in TUGboat that was the transcript of his talk on iTeX (ding) at the TeX Users Group 2010 annual conference in San Francisco (http://tug.org/TUGboat/tb31-2/tb98knut.pdf). He sees that 2010 humorous paper as the proper bookend for his first paper, also humorous, published 50 years ago in Mad Magazine. The booklet also has a 116-element list of references and a nice index. Computing historians and students of computing history who want to read another first hand account touching on the early days of computer science, or who are interested in what an eminent computer scientist says about writing computing history. Historians and computing people who are considering taking advantage of the relative ease with which one can today publish a monograph with worldwide distribution (e.g., Amazon.com) without involving the academic presses. And, of course, those of us who are interested in all things Knuthian.